Sorry, this product is out of stock at the supplier, and unsure if we'll be able to offer in future. The McMurdo Fast Find PLB is a potentially life saving piece of equipment that should be carried by those heading into remote areas with little or no chance of communication other than by Satellite. FAST FIND RANGER PLB is a lifesaving distress beacon with impact resistant rugged casing, designed especially for people heading to the outdoors. 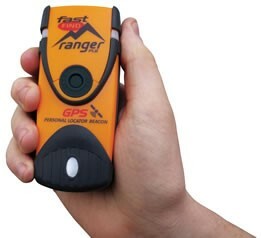 The FAST FIND RANGER PLB uses advanced technology packed into a simple, lightweight, palm sized unit. 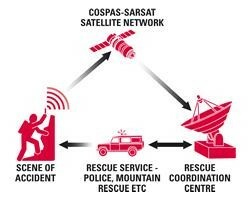 Using the dedicated 406MHz frequency, RANGER transmits your unique ID and precise GPS location to the global network of search and rescue satellites (COSPAS/SARSAT). Within minutes rescuers are alerted to your situation and receive regular updates. Finally, emergency services can home in on RANGER’s 121.5MHz transmission to find you. Explore the world with peace of mind. If you find yourself in a remote area without any other form of communication, activating your FAST FIND RANGER will summon emergency assistance. Once activated, the FAST FIND RANGER transmits a unique ID via the global 406 MHz search and rescue satellite network. The local Aeronautical Rescue Co-ordination Centre (ARCC), which in the case of the UK is at Kinloss Barracks in the north of Scotland, then forwards details of the emergency to the appropriate local Search And Rescue (SAR) services. 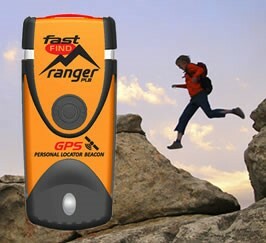 The FAST FIND RANGER features an inbuilt GPS receiver that can pinpoint your location to within a few metres and its 121.5 MHz secondary homing transmitter means that once SAR teams are in the vicinity they are able to home in on your exact location.The RANGER is subscription-free and does not rely on commercial call centres. Before taking the Ranger PLB away on an adventure, it first has to be registered with the Marine Coastguard Agency (MCA) and registration details maintained. This is because upon activation, MCA/ARCC will try to make contact with you and your Emergency Point of Contact (EPOC) from your registration details. Once sufficient information has been obtained, search & rescue resources may be sent to your location. In the event of contact details being out of date, there is the possibility that an emergency activation could not be treated seriously. This product is not a toy, it is a serious piece of emergency equipment that should only be bought and used by responsible people. You must select postage option for "Garmin/McMurdo FastFind" at the checkout for this item.